Top rated solid wood composite frame kit includes everything you need to create and display your little one's foot and hand print. Includes no mess white clay, two 3x3"image slots, hanging hardware for wall mounting, and easel style backing to use on desk or counter top. 1. Turn Frame over and remove the backing from the frame. 5. Place clay into cut out section of the frame, spreading it evenly with your fingers. Make sure to get all the way into the corners. Once you've created your baby's print, display on any table top, desk, or mount on wall to enjoy. Mounting hardware included. Makes the perfect gift for any new or expecting parents and baby shower! MAKES A GREAT BABY SHOWER GIFT: Give the gift that keeps memories alive forever! 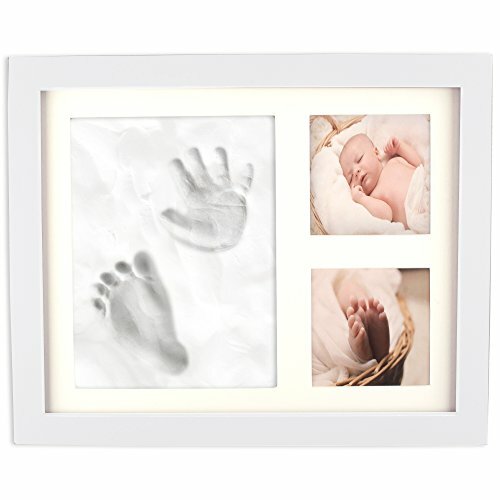 The expecting parents can keep the hand print and foot print forever with pictures of there beautiful newborn baby. NO MESS CLAY YOU CAN TRUST: The frame is constructed of fully sealed wood composite, keeping all moisture away from your clay. Keeps the moisture out your clay and remains mold free through time. Clay requires no mixing and is mess free.